Children grow up listening to stories or watching shows that depict heroes. These heroes inspire them, and are role models to them for courage, strength, gifts and talents, and character. Even as adults, we need people in our lives who we look up to and admire, and desire to emulate. Today I know one such extraordinary hero – my husband Ray. This is an update on the last 48 hours of our teams working hard to restore a sense of direction in the thick of discouragement among Haitians. Morning Star has become a field hospital. Many who have visited Morning Star have commented that it’s the best clinic in Port Au Prince. This is due to grinding, hard work by some. One who stands out is Ray Jones, who is serving as our medical liaison. In the first few days after the earthquake, he was our sole provider for medical help. Ray arrived on the scene as soon as he could. He is a critical care paramedic from Kansas City, MO. 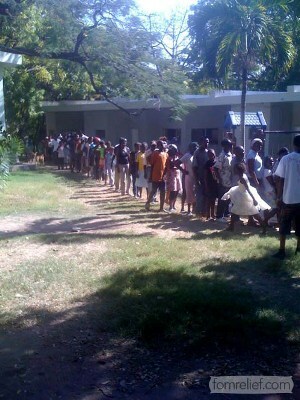 We have been able to see over 500 patients at our clinic. These patients are predominantly children. Some of the challenges we are facing are that many of them are dehydrated and malnourished. There have been 3 babies born at Morning Star the past 5 days. We had to amputate the finger of a little girl. We had no medicines to put her under, so we did it with only general anesthesia. If this was not done, she would lose her hand. Medicines are holding for now but more to come in tomorrow (Thusday). We have saved some 30 from dying because of the clinic over the past two days. This is a real number of those who have been aided in staying alive and getting to a place where they may gain strength to live. One of our other challenges is that there is a lot of diarrhea. This can be the beginning signs of disease (cholera, typhus, dysentary, malaria). We dug a latrine pit and did training for our tent city. We are showing them how to use it and the importance of using it. This is important right now as people are relieving themselves wherever they can. It could be very bad here in the coming weeks if this is not done. Most of the dead are off the streets, but there are many still buried in rubble. Between dead bodies and the bathroom situation, it could create some severe troublesome circumstances. There are many with staff infections from the cuts and scrapes suffered from the quake. This is why antibiotics are so critical. The two year old boy severe burns and exposed bowel that we evacuated to the Dominican is alive and doing well! We have spent the past two days networking with various agencies trying to secure supplies. Today, we are making a run to the wharf to meet a ship that promised supplies. Not sure exactly what they will be allowing us to get. We are, though, hoping it is food and water. We are getting low in those two areas. For those of you who wish to donate to Ray’s medical-security work in Haiti through his organization SEMSAR, you can donate through Paypal here.